Relationship and difference between ZJ&ZJP- Vacuum Pump - EVP Vacuum Solution! Both EVP ZJ and ZJP belongs to roots pump. They are same in pumping principal, working curve and application. Pumping principal:effect through two”8”?shaped rotors in opposite direction to reach suction and exhaust. Feature of roots pump: The roots pump has to be worked as pump unit together with frong-stage pump(such as rotary vane pump, piston pump, liquid ring pump and so on). The pump is widely used in vacuum coating, chemical, food, medicine, smelting, motor manufacturing and other industries. Especially when its front class pump uses a two-stage water ring pump, it can extract the other with a lot of water vapor, so it is very suitable for distillation evaporation,freeze-drying and other production processes. Function of by-pass valve: the pressure difference between the inlet side and outlet side of roots pump are limited. ZJP series roots pump adopts a by-pass valve. When the value of pressure difference reaches to a certain figure, the by-pass valve and reverse passage, which reduce the operational load of toots pump and front-stage pump greatly in the condition of high pressure difference. 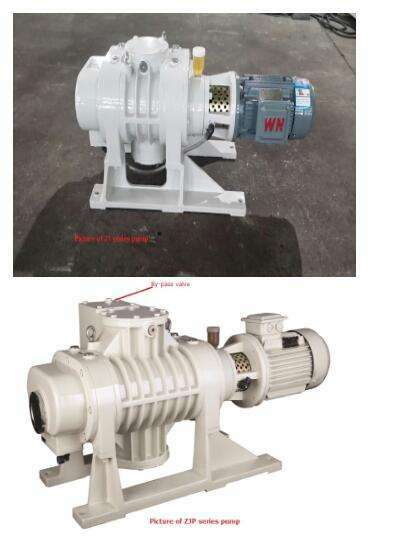 Meanwhile, due to the function of unloading when bypass valve opens, it makes sure ZJP series vacuum pump and front-stage pump start at same time to avoid the overload for both of them.